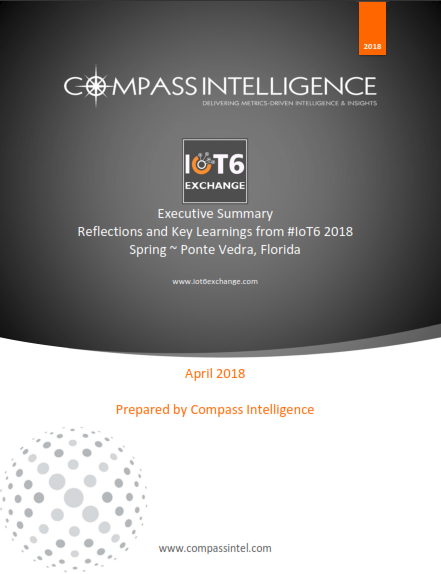 This executive summary shares highlights from keynote speakers, executive thought leaders, the advisory board, decision-makers, and influencers who attended the October 10th-12th IoT6 Exchange Summit held in Austin, TX at the Omni Barton Creek resort. This is the 3rd annual IoT6 conference, and we were excited this year to focus in on the Manufacturing and Industrial sectors, as this targeted area around IoT brought a diverse group of decision-makers and influencers including technologists, engineers, data scientists, operations/logistics professionals, and CXOs. Our keynote sponsors included Dell, Intel, and VANTIQ; platinum sponsor included Insight, silver sponsors included ClearBlade, MOBI, DataRPM, Oracle, Smart Dog Services, Telit, and CB Technologies; and bronze sponsors included Alluvium and DMI. This executive summary is complimentary, so please see below to get access to the full download.